It’s Lisa here to share a fun new card that I created to help inspire you to play in our JUNE — “New Beginnings” challenge. I have been having so much fun with the new Lia Griffith line and used many of her products to create today’s card. All of the goodies I used are listed below in the Inlinkz and you can find them all over at the a2z Store. I must say that I am totally loving Lia’s Inks. 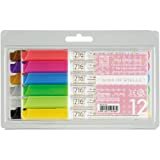 Not only are there fantastic colors, but they are deep and rich and the little cubes are the perfect size to use with her wonderful Cut Out Sets. I used a variety on this card to color the outfit for my sweet little bear’s outfit. They are also rich in pigment making them a great ink for “Heat Embossing”! Love Love LOVE! 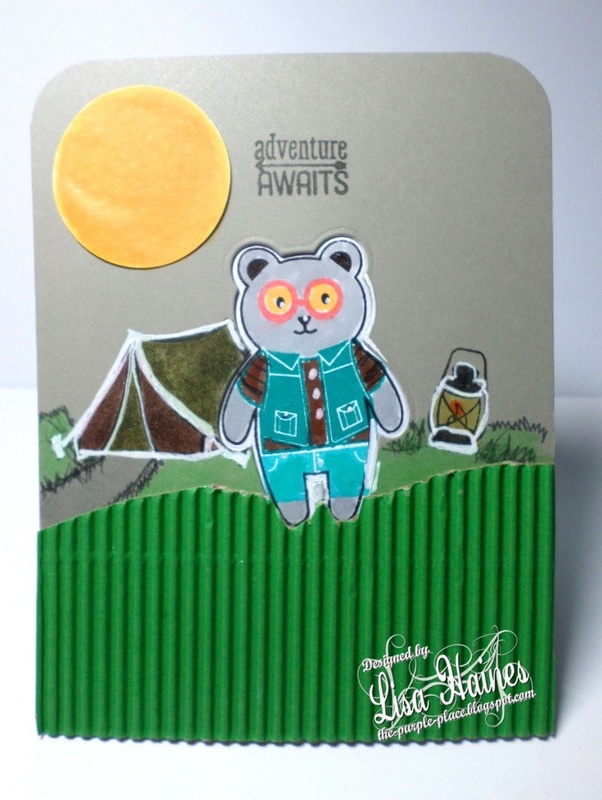 Here is my card — “Adventure Awaits”, featuring this sweet little Bear, known as Oscar, from this adorable stamp and cut out set DC157, by Lia. 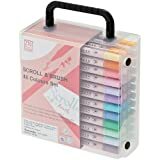 Another great item perfect for using with ALL you die cuts are the “Stick It” Sheets, which make is super fast and easy to add adhesive to any paper or cardstock before you run it through your Die Cut Machine. I used mine for my little bear and it works perfect with my SIzzix Big Shot! New Adventure — June Challenge “New Beginnings” for a2z Scrapbooking! Please be certain that you use at least ONE main Hero Arts product on your challenge project, so that you are eligible to win! You’ll want to add your project to the June Submission, which you can click to directly over on the right Side Bar. If you are headed over to the Store to do some shopping, please use my DT Promo code — LISAH15 — which will save you 15% off ANY and ALL orders of $25 and up (Shipping Excluded). Simply enter the code during the check out process and you’ll see the 15% automatically deducted! If you are looking for a product and can’t find it in the STORE, please do NOT hesitate to ask. We also offer CUSTOM ORDERS! And don’t forger that we now have our very own Facebook Page, Instagram, and we are also on Twitter and Google. All the hottest Social Media sites we all know and love. Direct links to each one can be found below my post! Oscar — His New Camping Adventure!! Thanks for stopping by – I will look forward to seeing your creations in our June Challenge! Good Luck and Happy Creating!! Categories: Challenges, Handmade Cards | Tags: a2z Scrapbooking Store, Bear, design team, Hero Arts, Lia Inks, Lisa Haines, Pigment Ink, Stamp n Cut | Permalink. Oh what an adorable scene!! 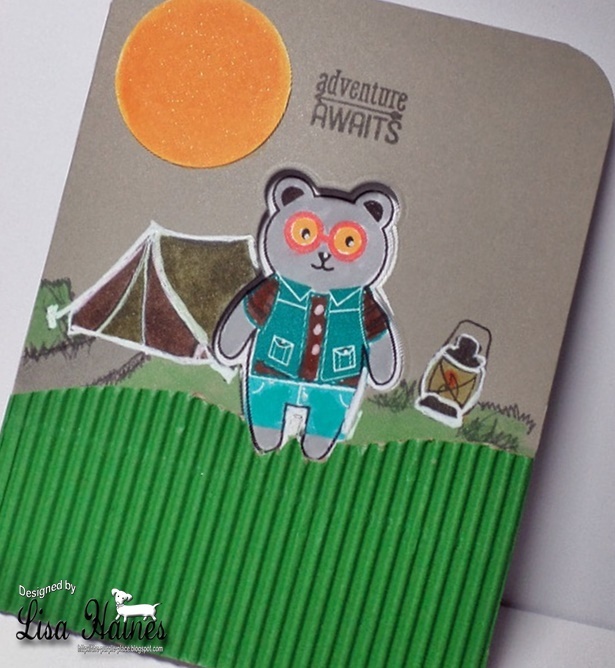 I think Lia’s line is so darn cute…Loved this OSCAR bear and thought he would be fun to take on a CAMPING TRIP! His NEW ADVENTURE!!! such a cute card Lisa. Just adorable. ooOOOooo Very cute!!! It’s precious! I love the eye balls lol – and the corrugated grassy hill is fabulous!